Details of the Straw Forward sculpture at the Carnegie Science Center. The straws were collected from nearly 40 restaurants, businesses and universities in the Pittsburgh area over a four-month period. The straws were then sorted, counted and cleaned to be used as part of the sculpture. 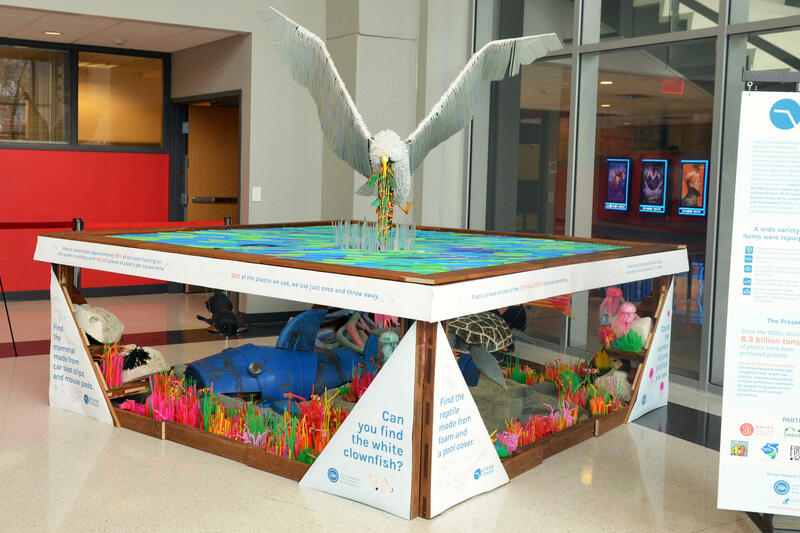 "The project was to use the ever present plastic straw as a way to create and spark some meaningful conversations around these global issues of plastic pollution," said Rebecca Bykoski, Sustainable Pittsburgh's Restaurant Program Manager. The project was spearheaded by Sustainable Pittsburgh, with help from local businesses..
Bykoski said some restaurants that donated their straws to the project have pledged to reduce their dependence on plastic straws or switch to recyclable options. "It's easy to target the straw just because they're so pervasive, and oftentimes unnecessary, and something that most people come in contact with in their daily lives," she said. Bykoski added that restaurants should keep some plastic straws on hand in case people with certain disabilities need them. Straw Forward will be on display at the Carnegie Science Center through Feb. 15. The creators are shopping it around to find alternative homes for the project, and are also soliciting ideas for how to creatively upcycle the plastic.